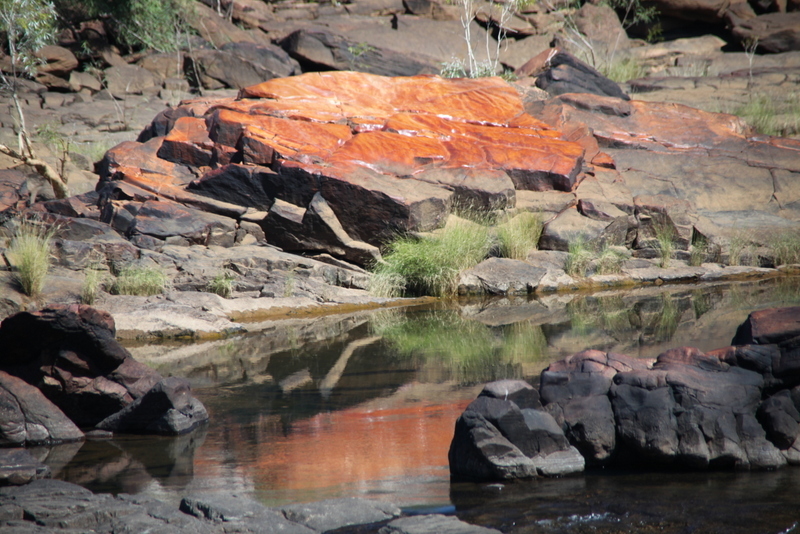 From the Gibb River, we easily reach Mitchell River in a day. Along the way the road gets progressively worse but we are still encountering nothing worse than corrugations and a few rocks, so have been making good time. Just before lunch we turn off the Kulumburu Road and onto the Mitchell River Road. It’s now mostly one lane and the corrugations are interspersed by areas of rock. Still Kaylee’s driveway is worse. 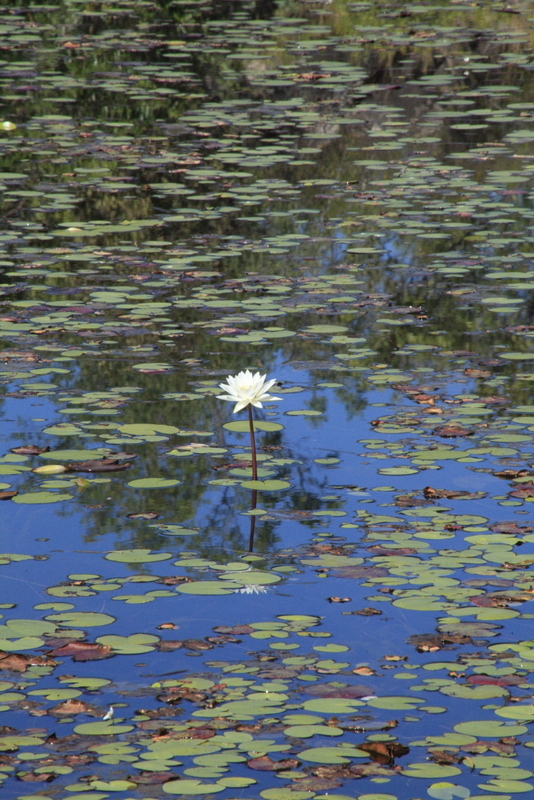 At lunch-time we stop at Munurru, a beautiful spot on the Prince Edward River, just 7 kilometres from the junction of the Kulumburu and Mitchell River roads and decide we will spend a couple of days here on the way back but in the interim just have a swim and quick lunch. 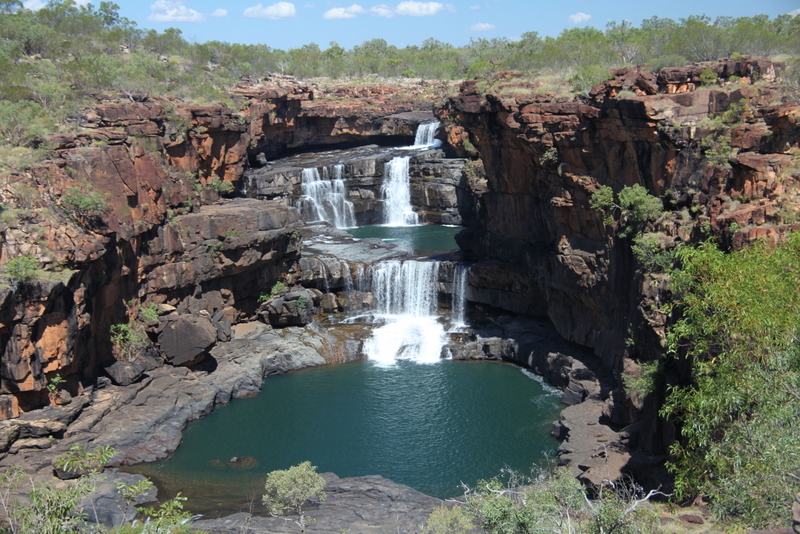 The 80-odd kilometres to Mitchell Falls camp ground takes us about two hours. Kaylee who has already been driving for a couple of hours decides she wants to drive the rest of the way to avoid car sickness from the windy, bumpy road even though we have agreed that no one will drive for more than two hours at one go and she gets increasingly grumpy as she gets tired. 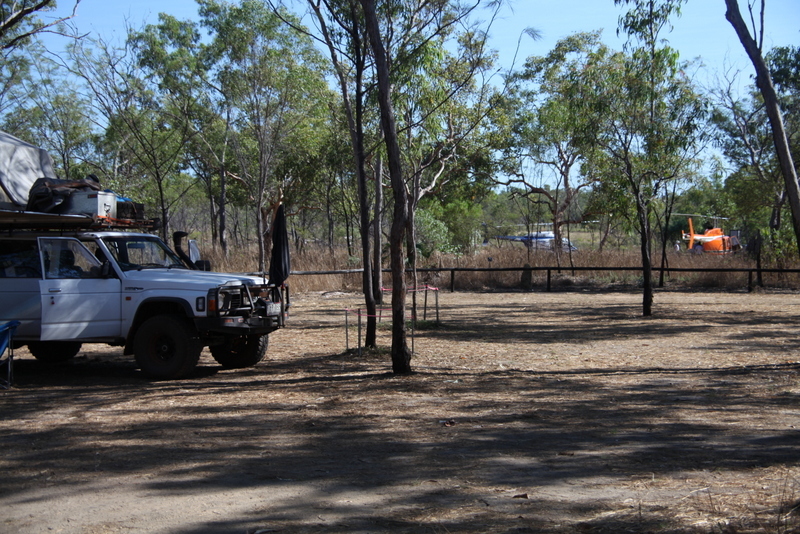 On arriving at Mitchell River tired, dusty and beaten up by corrugations we cannot decide how to park the vehicle. Roger simply wants to face it due north. Jill is worried about being too close to the neighbours and I want to ensure that the light on the car faces the proposed cooking area. Since all of these things are mutually exclusive we end up moving the vehicle at least four times, by which time neighbouring campers are throwing things at us, Kaylee wants to kill us all and the vehicle ends up almost exactly as it started. Much like last time. Don’t they say the definition of stupidity is repeating the same mistakes and expecting a different? At this point Kaylee decides she is turning into a bogan because she keeps saying “me” instead of “my”. She tells us that it is now our duty to correct her on each occasion and, if she corrects herself, to give her a Lindt ball each time. I have a strong suspicion that Kaylee actually has no concern about her speech but simply wants to have to eat lots of Lindt balls. This reminds me of the joke about the Australia cricketer who sledges and English batsmen asking him why he is so fat. The Englishman replies that it is because every time he sleeps with the Australian’s wife, the wife feeds him a Lindt ball. Except he doesn’t say sleep. After a month we are all occasionally getting on each others nerves and so the conversation morphs into one about remediation of bad habits, preferably each others rather than our own, and behaviour modification to prevent us all killing each other. We cannot agree however on who’s habits most require modification, other than that Jill wants Roger to become less predictable which, given that the single most predictable habit of the entire trip is Jill’s requirement for tea at ten minute intervals, might be a case of pot, kettle, black. In the morning we set off early for Mitchell Falls. It’s an easy walk through beautiful country. For the last few days we have been passing through mostly open woodland interspersed with palm forest and stunning rock outcrops. It’s rich with birdlife and wildflowers. Periodically it morphs from savannah, into palm forest and then into littoral forests some of which is remnant rainforest. Much of the landscape is dominated by giant escarpments. 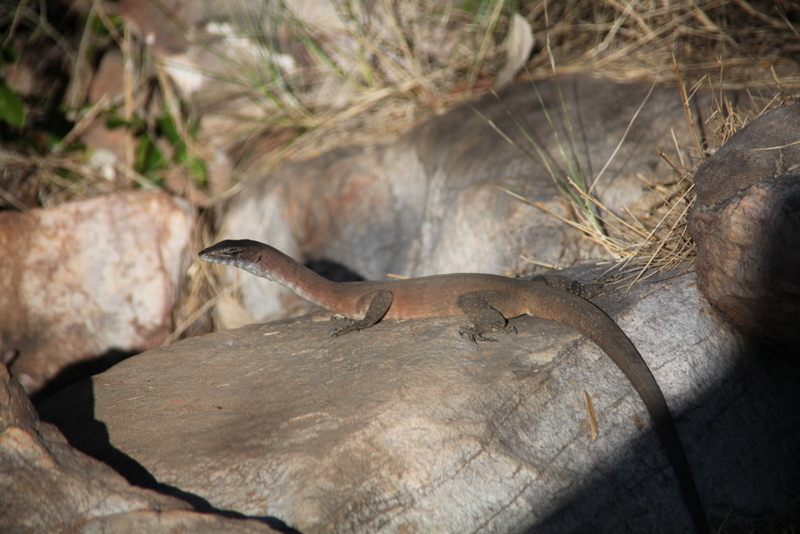 It’s incredibly rich but diverse and when one adds in the presence of boab trees everywhere gives the Kimberley landscape a form that is not similar to any other landscape in the world, although the African veldt is probably the closest. 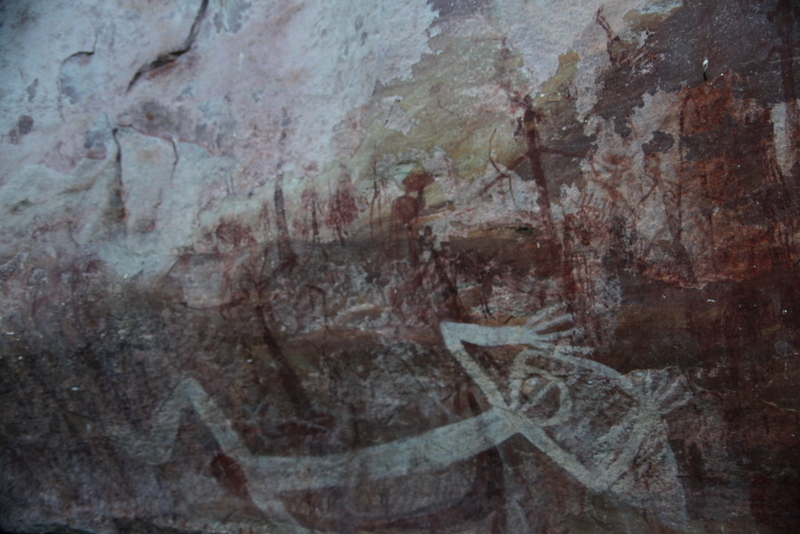 As we move through the valley of the Mertens River towards the Mitchell River we descend alternatively into rich, wet valleys rich with Aboriginal rock art and palm gullies and then climb back into rock country, littered with outcrops and spinifex, and interspersed with grevilleas, acacias and kapok bushes. As we walk we pass flocks of finches and red-tailed black cockatoo. There are three sets of falls on the walk, Little and Big Mertens Falls and Mitchell Falls, the last of which is, itself split into four sets of falls, even in the dry. 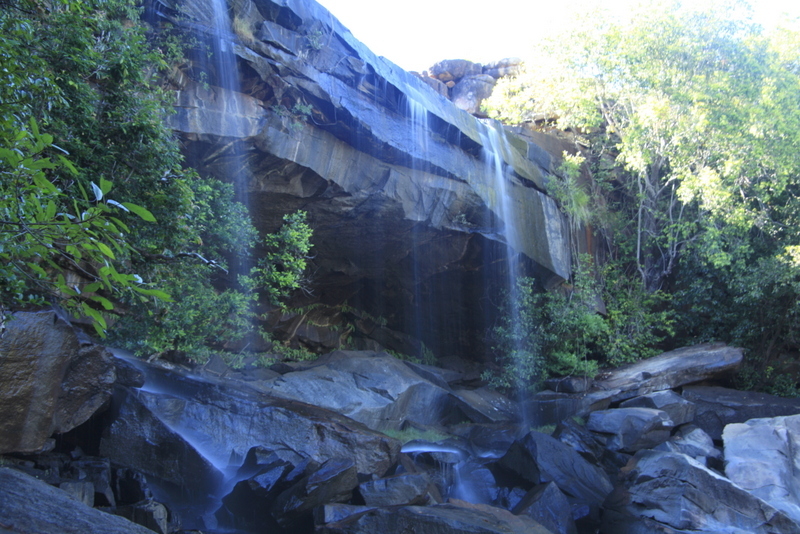 In the wet it splits further into several more falls as the side channels pour over the rock platforms on top. One approaches all three falls from the top across highly polished river rock, allowing easy access and great views down the gorges. 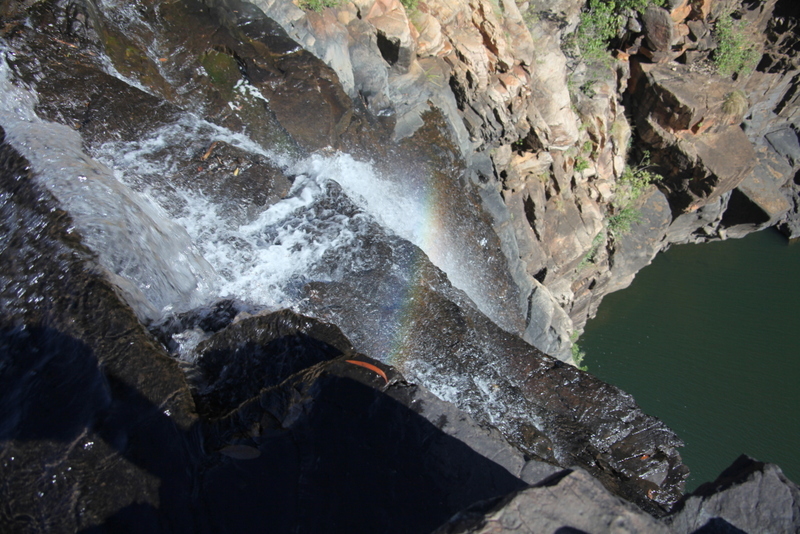 In the dry season both rivers follow a smallish main channel down over the falls but the rock platforms are easily 200 metres wide at the top of the Mitchell Falls, incised by deep gullies and channels. Even mid-way through the dry a good flow of water is dropping over the main and side falls. The Mertens River joins the Mitchell below Mitchell falls. We make our way around the falls to a long-deep pool just below an upper fall and join the relative throngs (about 20-30 people) relaxing in the water and shade. Above the falls one crosses the main channel, where it widens and it’s there that the teeming masses who cannot be bothered to walk back take the 6 minute, $130 helicopter ride back to the camp or the lodge. It crossing also leads down to the main viewing point back to the fall. 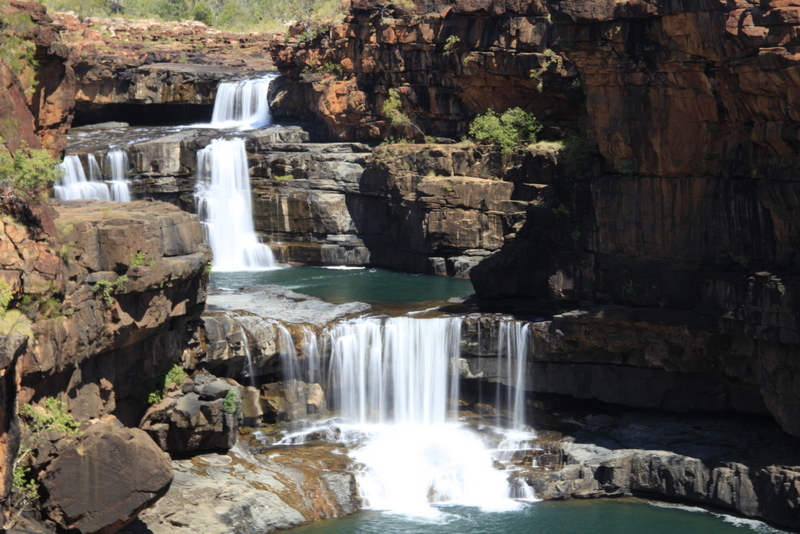 Lunchtime is peak hour at Mitchell Falls but by 2 pm there are only a handful of people left and by the time we leave at 3 pm there are just us and one other family. In the air and at the campground on the other hand it is apocalypse now. There are four helicopters operating and they land just metres from the campsite shuttling back and forth to the falls every few minutes. It is at moments like these that one wishes for a ground to air missile. We walk back to camp stopping to swim along the way. The red tailed cockatoos are kicking up racket in the trees as we pass. In the morning we head out and back to Munurru. Good to hear from you. Hope you are well and happy and that we catch up soon.